"To all of the Sutherlands...our condolences, fond memories..."
"My sweet friend, I will miss you. Both you and Chic are a..."
"heartfelt condolences to the Sutherland family. Pat was an..."
"With deepest sympathy to Chic and family. Ken the Barber..."
"Ahoy! MaryAnn and I were saddened to hear of Pat's..."
Long-time Vancouver, WA resident, Harry "Pat" Sutherland, passed away on Friday, July 10, 2015 in Vancouver, WA at the age of 93. Pat was born in Vancouver on August 17, 1921. A long-time educator, Pat was an elementary teacher, principal, and retired from Central Washington University in 1983. In his early years, he worked for the CC Corp in 1939 and was a member of the Clark College 1947 Championship Basketball team. 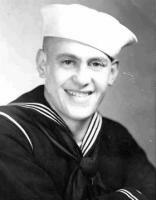 He served his country in WWII in the U.S. Navy and survived the sinking of his ship in the Battle of Guadalcanal. He was a Purple Heart recipient. Pat was active in Kiwanis, Jaycees, Knights of Columbus, 4th Degree, and a life-time member of the VFW Post 7824. Post members will serve as honor guard at Pat's services. Pat is survived by his wife of 66 years, Chic Sutherland; his children, Colleen Hammontree, Heather Biggs, and Kelly Sutherland; 5 grandchildren; and 5 great-grandchildren. Services will be held at Evergreen Memorial Gardens, 1101 NE 112th Avenue, Vancouver, WA 98684. A Rosary will be Thursday July 16, 2017 at 3:00 p.m., with a viewing and separate hospitality room following the Rosary at 4:00 p.m. and graveside service will be held at 11:00 a.m. on Friday, July 17, 2015. The family requests that contributions be made in the name of Harry "Pat" Sutherland, Veterans in Need, VFW, Post 7824, 400 N. Andresen Rd., Vancouver, WA 98661. Please sign Harry's Guest Book at www.columbian.com/obits.